The audio disc is a 56 band, 102 track collection of Mp3's. You get 1-3 tracks each from Terraplane, Litmus, Ahkmed, Orange Goblin, and a load of bands I'd not heard of before, many of whom I've got high on my list to check out after hearing these tracks. Lots of seriously heavy music here and a stunning variety too. Also included are 14 tracks from the Belgium based Bone Structure Records label, which is characterized by soundscape/experimental excursions. The DVD features 70 minutes of promotional videos and live footage from Wicked Minds, King Suffy Generator, Imogene, Antonius Rex, Taras Bul'ba, Lento, Northwinds and Manatees, plus a gallery of the amazingly warped artwork of the Malleus Rock Art Collective (who did the Tab 6 cover you see on this page… check them out at www.malleusdelic.com). And I was pleased to see the same Tim Burton Nightmare Before Christmas type animated dude hosting the video that was on the Tab 4 DVD. Finally, the package comes with a thick glossy digest sized magazine with information on all the bands appearing on the audio/dvd discs, including features/interviews on Bone Structure Records, Fire Witch, Gnaw, Taint, Orange Goblin, and the Malleus Rock Art Collective. A LOT of work went into ALL of this and it shows. And at $25/£12 it's a STEAL as it'll keep you occupied for days. HIGHEST recommendation. 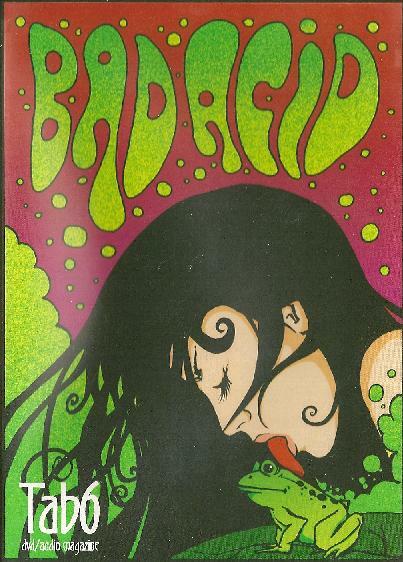 For more information and to order a copy you can visit the Bad Acid Myspace site at http://www.myspace.com/badacidmagazine. Email publisher Dave Gedge at: badacid@hotmail.co.uk.